Facebook is moving fast towards changing their mantra. 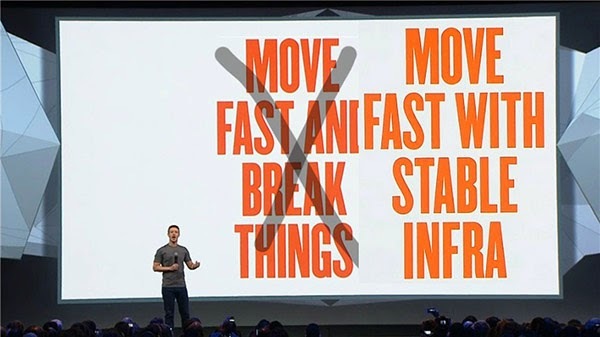 From "Move Fast and Break Things" to "Move Fast with Stable Infra". Huh? Essentially, Facebook is saying, yes, moving fast is important, but it's important to get it right, to fix those bugs quick, to be stable. This is what Mark Zuckerberg said at the F8 conference: "We used to have this famous mantra ... and the idea here is that as developers, moving quickly is so important that we were even willing to tolerate a few bugs in order to do it,". So no more bugs on the way to breaking bad? "What we realized over time is that it wasn't helping us to move faster because we had to slow down to fix these bugs and it wasn't improving our speed." This is actually good news for us. With so many trends like social gaming happening on Facebook at warp speed, this will do both the general Facebook population and brands good. "A firm commitment that we'll be able to fix all major bugs within 48 hours," he said, He did not forget to mention that with more than a billion users on the platform, this will also pose challenges. This is post-IPO Facebook. Zuckerberg growing up, deciding kind of still to jump but with parachute nicely tucked in backpack. Now brands are going to ask a few questions along the way. We know that organic results are down on Facebook. And mobile is up. Facebook have 1 billion active users monthly on mobile. And mobile ad revenue is up 30% from last year. That's fast. But is that stable? Facebook is just becoming more and more commercial. It is moving brands away from organic to paid.